I am often amazed at the number of North American golfers who don’t watch the European Tour. I find it to be some of the most exciting golf on TV and the players are not only talented, they are entertaining as well. 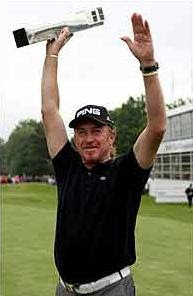 And one of my very favorite “entertainers”, Miguel Angel Jimenez, just proved that golf is ageless. 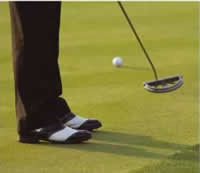 At the ripe age of 44, the Spaniard is the oldest winner ever of the BMW PGA Championship at Wentworth. But like fine wine, he just keeps getting better. This past weekend, he had played some of the best golf of his life, coming from a 4 shot deficit to beat Oliver Wilson in a 2 hole playoff. Always a favorite with the crowds, Jimenez wears designer shoes that you’d more likely see on a runway than on a golf course – he’s always got a cigar close at hand – he loves his wine and he sports a bushy poneytail that begs to be pulled (or cut off :)) He’s also known affectionately as “The Mechanic” for his love of fast cars. With this win, Miguel Angel shot to the top of the European Order of Merit and the European Ryder Cup standings.